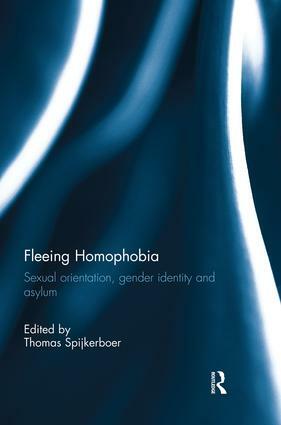 "Thomas’ Spijkerboer’s new collection Fleeing Homophobia offers a rich sampling of analysis and critique of asylum decision-making for people at risk of being persecuted because of their sexual identities. This is a vital area of leading jurisprudential developments over the past ten years, which has garnered intense scholarly attention. Fleeing Homophobia makes a compelling contribution." "Fleeing Homophobia brings together a collection of socio-legal essays written by established and early career scholars of refugee law. The collection develops from the Fleeing Homophobia project, and an earlier conference on the same theme, and aims to provide a timely and critical analysis of law and practice in the adjudication of sexual orientation and gender identity-related asylum claims. This collection is essential reading for students and practitioners of refugee law. It engages in-depth with the complexities of asylum adjudication, and the many difficulties encountered by those ‘fleeing homophobia’ in ensuring that their claims are heard, and recognised. While highlighting significant political moments in asylum adjudication, each of the contributors urges caution and continuing attention to the practice of asylum law." Thomas Spijkerboer is professor of migration law at VU University Amsterdam. He has published on gender and sexuality (Gender and Refugee Status, Ashgate 2000; Women and Immigration Law, with Sarah van Walsum, Routledge 2007). He also publishes on the role of courts in migration law, and on border deaths.